There’s a group of ageing Hollywood actors who appear to have given up learning their craft. They might have been a hot ticket in town 30 years ago, but now they turn up in forgettable films, probably thinking only of the paycheck. For as long as I write and perform spoken word, I never want to slip into this mentality. I always want to be able to look at other poets – and folks in other creative fields – and take something from their work that hadn’t occurred to me. To chart my progress so far, I need to go back to the Millennium, years before I began writing. This was when I first heard the Gil Scott Heron track The Revolution Will Not Be Televised on the radio. I’d never heard anything like it, this relentless and repetitive stream of consciousness with cultural and political references I only half understood. It opened my eyes to what can be done with words. I eventually bought the whole album on vinyl, and it’s of an equally high standard. Another early influence was Original Pirate Material, the debut album by The Streets, and its follow-up A Grand Don’t Come for Free. I was at university at this time and whenever I listen to these, I’m transported back there. Looking back, I can now spot weak points in the lyrics, but I particularly admire the concept album structure of the latter. There are two other major releases by The Streets that followed these, but I’ve never liked them as much as the first two. These days, I continue to be influenced by those I’ve seen and heard: the humour of John Cooper Clarke, the forthrightness of Andrea Gibson, the politics of Alan Bissett. I recently attended two performances by my friend Gemma Connell, who’s a dancer. But as well as movements, she made prolonged eye contact and even brief physical contact with members of the audience. And last week, I once again saw Luke Wright, who gave an energetic performance of What I Learned from Johnny Bevan. I’m now asking myself how can I make an audience feel the same way as I did, but using my own words. Of course, there comes a point where I can have too much creative input and I think I’ve reached that stage now. So I’m going to let it settle, then start writing my own original pirate material. On Tuesday two weeks ago, I was hurrying back to the office after lunch to prepare for a meeting. En route, I spotted tourists taking photographs of nearby statues, taking advantage of a brief window of sunshine in an otherwise rainy week. Exactly a week later, I was the tourist at the Edinburgh Fringe squeezing past locals in bus stops as they went about their business. This started me thinking about point of view in the stories we write. I didn’t mean to take so long over lunch, but I was dreading that meeting. Profits are down for the third quarter and couldn’t explain why. Just then, some tourist, not looking where he’s going, steps back trying to get a picture of some statue and knocks the papers right out my hand. He’s in a world of his own and if I wasn’t so late, I’d have had a word with him. But I picked them up and carried on and went to the meeting and just said customer engagement was better than ever. Finally, a sunny afternoon after all that rain. Thought I’d take the chance to come out of the museums and take a few photos round the town centre. There’s an enormous statue of Queen Victoria so I had to step back quite a bit just to fit it all in. Next thing I know, bumped into some local who’s more concerned with reading documents than looking out for people. Said I was sorry, as you do, but she just ignored me. Fine by me. I got the picture I wanted. On Tuesday afternoon, Alice left the pub clutching her documents with five minutes to spare until the meeting. She still could give no good reason why profits were down for the third quarter. Meanwhile, Ben cupped his hand to his camera screen against the strong sun. The statue needed a wider angle. Without turning around, he stepped back. At that moment, Alice turned the corner and they bumped into each other. The first and second passages are in the first-person voice. The characters use ‘I’ and ‘me’ to describe what’s happening from their perspective. But neither of them knows what the other is thinking; they can only make assumptions based on the actions of the other party. This voice is an excellent way to portray an unreliable narrator. The third passage is in the third person, a more objective point of view. The narrator uses ‘she’, ‘he’ and ‘they’. We now find out the names of the characters, which is also possible in the first person. But that would require a self-introduction or for a second character to mention the name, which might distract from the story. It’s also revealed that Alice was in the pub. Was this detail simply not at the forefront of her mind, or is she an unreliable narrator with a drinking problem? So we have a choice to make, and it’s a choice that beginner writers sometimes struggle to make. Even experienced writers occasionally need to rewrite. A few Novembers ago, I was writing an alternate history novel, where the past is reimagined in some way. In mine, the petrol engine wasn’t developed until the end of the 20th century. My plan was to tell the story from the point of view of a historian who had interviewed the reclusive inventor; this would be peppered with newspaper and journal articles. The technique didn’t work. I couldn’t find enough material to construct a detailed narrative. I recalled some advice I was once given that if a piece isn’t working, the point of view is often the cause. I’ve found this to be true. I decided I had to let the inventor speak for herself, and the story came alive. The first thing she did was attend an office Christmas party and hit her boss with a glass bottle. Earlier this year, I read a letter in Writing Magazine that a subscriber’s own story wasn’t working from his main character’s point of view. He explained how and why he rewrote it in the third person, then rather grandly signed off the letter with First person – last choice. However, I disagree; the point of view will probably change depending on the story you write. In the case of a novel, there might even be shifts from first to third or vice-versa from one chapter to the next. If the subscriber in question did stick slavishly to third-person, he would probably encounter the opposite problem eventually, as I have recently. The first- and third-person voices are by far the most common, but there exists a far rarer alternative: the second person. This is where the narrator uses ‘you’. It’s a personal opinion, but I believe this technique is only effective in poetry, as it gives the impression of the poet writing a letter to a third party. In prose, it can feel as though the author is instructing the reader. A novel in the second person can be done, however, as Angelina Mirabella found out. As I’ve had a busy week, I haven’t been able to construct a full entry. So this week, it’s over to you. Is there something you’ve always wanted to ask me? Whether it’s related to writing or not, now is your opportunity. I’ve been falling behind on my submissions to publishers. One of the most important steps a writer can take is to keep track of the submissions made. Below is an excerpt from my own tracker, a Google Documents sheet. You can click the image to make the text larger. When you routinely send pieces to publishers, you start to develop a gut feeling about those to avoid. One publisher seemed evasive about giving anything more than an e-mail address and a Skype number, while another promised a cash prize for the winner but stated that the piece wouldn’t be published unless they felt like it. If it feels dodgy, steer clear. I now send my work almost exclusively to publishers rather than competitions, although I’ll make an exception on occasion. My main motivation is the cost of submission, which often seems disproportionately high, but I also tend to find them less well-organised than commercial publishers. I can’t stress this enough: read the submission guidelines, then read them again, ideally out loud. The publisher will usually be specific about the type of work wanted, the word or line count, the format in which it should appear, the method by which it should be submitted, the deadline, plus any other relevant information such as a brief biography. Great story and poetry templates are available at William Shunn’s website. Whether or not it’s requested, make an effort to find out the name of the editor or the person who’s taking submissions. Don’t worry if you name the wrong person; it shows you’ve at least done some research. I’ve had experiences where submission guidelines for competitions have been unclear or even self-contradictory. If you’re in any doubt about them, don’t hesitate to ask the organisers. That signals to them that their explanation isn’t clear. I know it sounds as though I’m insulting your intelligence, but don’t miss the deadline if you can possibly help it. The overwhelming majority of submissions are done online, and most publishers will accept entries up to 11:59pm on deadline day unless otherwise specified. For the few places that accept or insist upon postal entries, it’s worth checking whether the publisher wants your letter by the deadline, or whether the postmark date will be taken. If your submission is late, there’s no harm in a phone call or an e-mail to the publisher regarding whether it’ll still be accepted. We’d all love to be told instantly about the result. I once posted a piece on a Monday and received a rejection on the Friday morning, but that’s a rare experience. Publishers receive dozens or even hundreds of pieces, and you could be waiting up to six months for a response. Always be aware that you might not receive any response at all. The New Yorker, for instance, advises contributors that owing to the volume of submissions, they should assume it’s a rejection if they haven’t heard within 90 days. Very often, a publisher won’t allow a short story or poem to be under consideration by anyone else; that’s why it’s wise to have a number of other pieces to send elsewhere in the meantime. If you’re a novelist submitting to an agent, however, simultaneous submissions of the same book are acceptable. I store each of my stories and poems in individual PC folders. Whenever I submit somewhere new, I always create a new file within the folder containing the latest revision and specifying where it’s been sent. Most submissions are done by e-mail and few are done by post, as explored earlier. Shorter pieces might be accepted by filling in a form on the publisher’s website. The Submittable site is popular among some publishers. This not only accepts documents online but allows you to track the status of every submission. Whichever online method is used, you’ll usually receive a receipt by e-mail. By post, place a stamped and self-addressed postcard in the envelope so the publisher can signal when it’s been received. 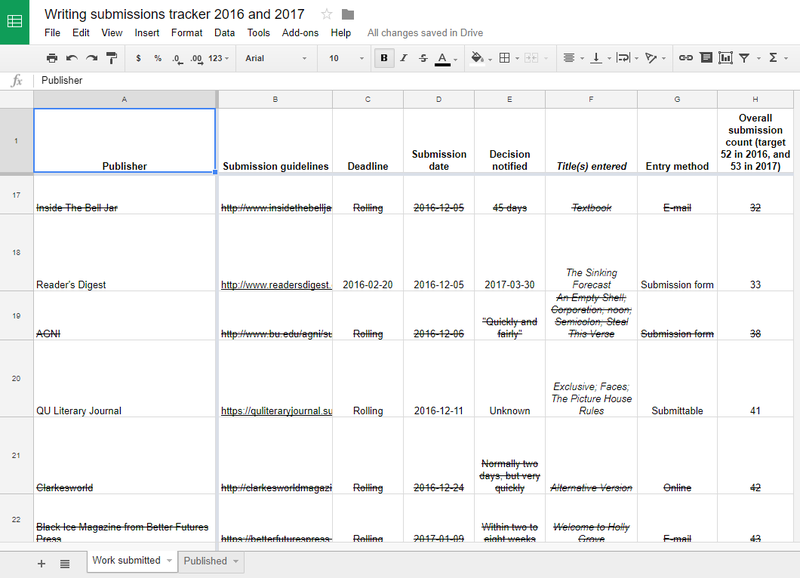 Every year, I set myself a target of submitting 53 pieces to publishers; one a week on average, plus one for the extra day or two that comprises a year. It’s a generously low target, but my immediate mission is to catch up and keep pace. I normally try to stick to one theme per entry, but it would be remiss of me not to mention the Rappers Versus Poets event hosted by the BBC on Saturday night. I know a few of the poets, either personally or by sight, but I’ll leave you to watch it and find out whether they won or lost.